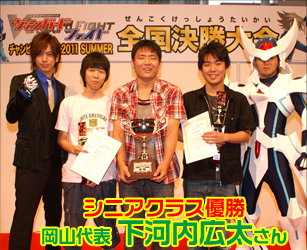 Kagami is on the left, between Daigo and Shitakawachi; his trophy is masked by his certification. Kagami made his debut in the Nagoya finals, being the only national finalist to have not faced a pure Royal Paladin deck in his regional. His competition, Kamachi Yutaka, used a mix of Royal Paladin, Oracle Think Tank and Bermuda Triangle cards. She used draw power in an attempt to close the difference between her and her opponent's more expensive deck. However, Kagami's deck was more fluid and its synergy eventually saw him to Japan's first national tournament, where he would take third place after his loss to Shitakawachi. He is not known to have participated in the Grand Prix. Kagami's decks are regarded as being very cut and dry Royal Paladin, always giving precedence to Alfred with Soul Saver support. For the regional, his choices in cards were very practical and made in light of what had been known to work at the time, as Nagoya was the sixth regional to be completed, running behind the two Tokyo blocks for the last spot. Gordon's especial intercept is used for defense, Randolf to make unboosted attacks on 11000-power units, Soul Guiding Elf and Marron to boost Bors, Pongal to search Soul Saver Dragon, and Barcgal to superior ride. Kagami made only a few changes to his decklist for the national, introducing Lien while cutting Randolf and Soul Guiding Elf. Notably, the deck is identical in every way to Shitakawachi's save for card ratios; the determining factor in their fight was how many of each card the national champion chose to use.